Zinstall Migration Kit Pro allows you to perform a complete and efficient corporate-wide migration of end-user workstations to new hardware and/or to new OS. It allows to transfer programs, settings, profiles, personalization and data, and can transfer cross-hardware (i.e. HP to Dell), cross-Windows (such as Windows 7 to Windows 10, or, of course, Windows 10 to Windows 10) and cross-architecture (i.e. 32bit to 64bit). This is not a "Ghost" or image transfer: rather, what is transferred are the contents of the workstation, and not the OS itself or its system components. It fully supports transfers in a domain, and allows for selective transfer (for example, only profiles and data without programs, or just some of the programs, or some of the profiles). It can even migrate between two different domains, from local to domain, from physical to Cloud and so on. Transfer can be done directly over the network, or indirectly, using intermediate storage such as a network share or a NAS. Encryption can be enable to store data securely. Using the product, IT staff can save 2-4 hours per each user migrated, which quickly translates in significant cost savings. In addition, automated migration minimizes user frustration and rejection risk, and eliminates the "migration shock". Migration Kit Pro can be used for corporate-wide, concurrent migrations, and the entire migration process can be performed remotely. It allows command-line execution of the portable, single-file migration package (no installation required) - and can be integrated into SCCM or other centralized management tools already in place. For each user, the Kit can transfer applications (even non-standard or in-house ones), settings, files and user personalization, so that the user's environment stays exactly the same. IT tools also remain operational as well after the migration, as well as domain settings, permissions and policies. The Kit supports all Windows versions (XP, Vista, 7, Windows 8/8.1 and Windows 10), editions (from Home to Ultimate), 32-bit and 64-bit systems. Being able to transfer everything does not mean that you have to transfer everything. The migration is fully configurable, allowing to define which applications, profiles and data are transferred - or not. It also includes a special "profile and data only" mode for companies who prefer to keep the "golden image" for applications - while preserving the personalization for each user. Interested in simplifying your migrations and PC refreshes? Contact us and request an evaluation copy! Discounted pricing starts with $50 per license for 10+ licenses (each license is valid for 1 source and 1 target machine - see here for discounted purchase link), and higher discounts for larger quantities. Every 3-4 years, the workstations have to be refreshed with newer models. The user environment, however, has to be preserved and deployed on the new hardware. With ZMS, you can save 2-4 hours per each workstation deployed, and minimize user downtime, frustration and support calls. ZMS can transfer user files, user profiles, personalization and even programs to the new computer. The Kit supports transfers from any Windows to any Windows (Windows 10, 8, 7, Vista, XP), P2P or P2V. It is automated, can be launched remotely, in an unattended process, and supports a variety of possible transfer scenarios. 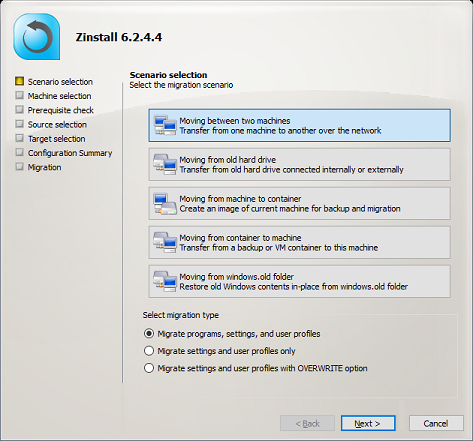 Similar to PC refresh, ZMS can also migrate in-place, when a newer OS is deployed on existing machines. In this case, the contents of the machine are first captured onto a separate storage location, and then - after the machine is imaged with the new OS - everything is restored right back, resulting in a restored and fully functional user environment. Migration can be done not just to physical machines, but to virtual and cloud environments as well. Using Zinstall, the users can receive their new, virtual environments in a very similar configuration to what they've had on their physical machines, easing the transition. Not only the migration can be done to any vendor (Amazon, Azure, Citrix, VMWare etc), it can even be done from one Cloud environment to another (such as Amazon to Azure), eliminating vendor lock-in. Zinstall Migration Kit Pro is made for IT - providing a versatile, manageable and resilient solution for all corporate migrations needs. The Kit decreases migration and deployment times, and dramatically reduces the TCO - while increasing user satisfaction, eliminating support calls and end-point visits. For more information, please see the detailed Migration Cost Analysis, or contact us for more information. Zinstall customers include IBM, BP, Philips, UCSF, Cornell and many more. Click here for more.